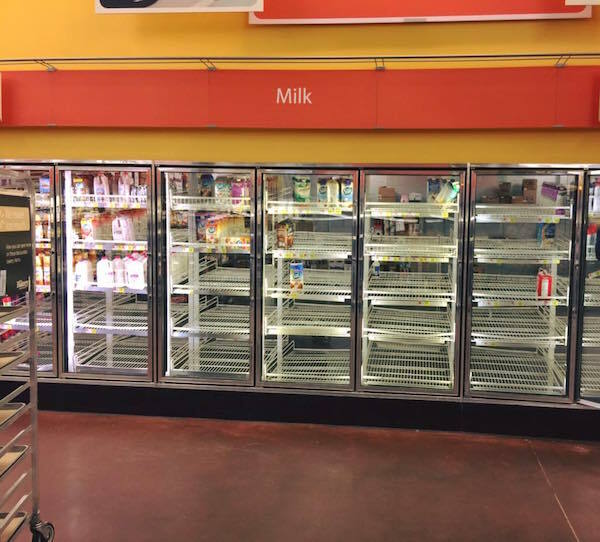 Can you picture empty store shelves? A couple of weeks ago, in early January, there was a relatively minor storm in the South and Southeast U.S. Cold weather, threat of the power going out, snow and ice and empty store shelves. This wasn’t the big one. And yet it was enough to bring things to a panic. If this is how people react to an extreme cold spell, then what happens when something major hits? With about two months of winter to go, it is the kind of routine disturbance that is likely to happen again without much ado. A much more severe storm may come as well. 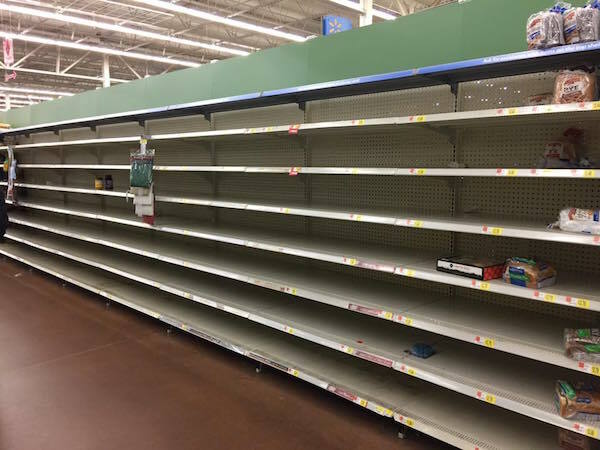 Shortages, and ill prepared people scrambling about for the final available resources. The angry race to the checkout line probably elicited road rage, fights and arguments… the storm that is brought out in people poses perhaps an even larger threat than the natural disaster, etc. itself. After a few short hours ahead of a short-lived bitter cold, practically everything was gone – and nothing even happened yet. None one had gone without, and things hadn’t even gotten the chance to turn ugly. 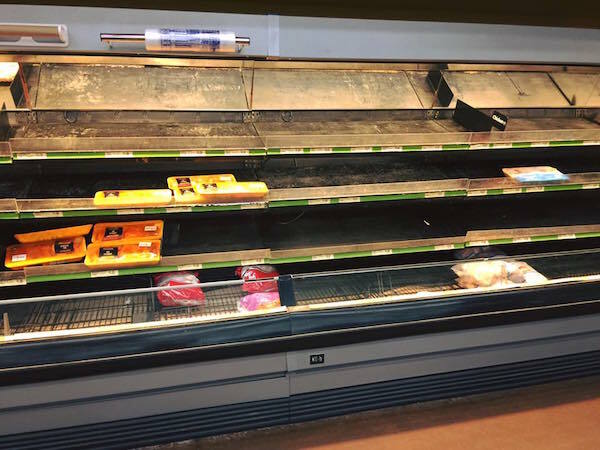 If this had been a true crisis, and not just extreme weather over the weekend, people would have killed and died over a cart of groceries, some bottles of water or some fuel… and they could have prepared instead. 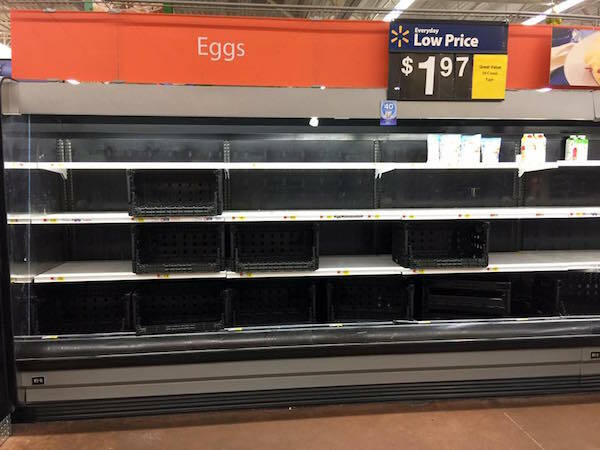 These photos show that society is completely unprepared for ANYTHING AT ALL out of the ordinary… and if it lasts more than 12 hours, it will cause complete chaos shortly afterwards. The people you see on the streets, in your community, and especially in the big cities, would be lucky on average to make it three days with the back-up canned goods and last pickings stored in their cabinet and fridge. After 12-72 hours without ATMs and EBT debit cards working, and without food to buy at the stores, electricity and other services, people will absolutely lose it. There will be nothing else holding back the inner animal. That is when everyone you in the general population becomes a threat against you, and a liability to your survival. Do your friends and neighbors know that you prep and store lots of extra food, fuel and supplies? Will they be knocking on your door for shelter and refuge, only to eat through your carefully-stocked cache? Will their greed, ignorance and stupidity give you away, open you up to outside attacks, get your arrested or even killed? There will be a lot revealed about the human character the next time a rise crisis hits and something lasts longer than a weekend storm. Becoming self-sufficient, and cutting yourself out of the loop of dependency on the system, supply chain and people around you might be a good thing to do. At the very least, a couple extra weeks of everything you might need in a crisis should be the minimum step to take – as political and economic unrest may well be coming, along with perhaps more than the average level of natural disasters and extreme weather events.These are not normal times. h/t Vic Bishop at the Waking Times.